Professional cosplay model, Bunny Bombshell, praised the creativity by participants at the costume contest of the initial Causeacon which ran Friday through Sunday, April 28-30 at the Beckley Convention Center. Bombshell told winner, Jennifer Peake, that "I've judged a lot of contests over the years and I can honestly say your took cosplay to another level. 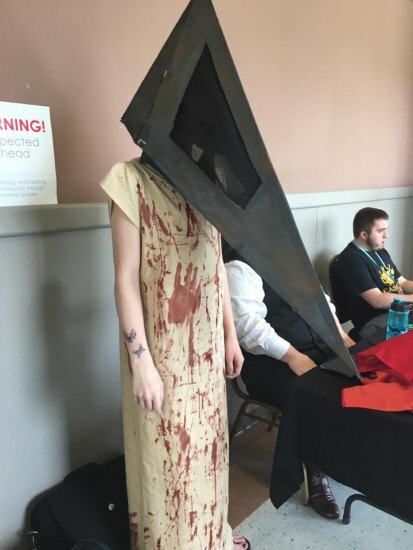 While you might technically be a beginner, your cosplay was top notch!" Peake, the first place winner for best of show, told Bombshell "Your costumes are amazing and have inspired me to top this one next year". Bunny, who is originally from Huntington, has been drawn by multiple comic book artists and has been cosplaying for over 10 years. She has portrayed several characters such as Catwoman, Emma Frost, Sailor Moon, Valkyrie, Black Canary, She-Ra, Spider-Gwen and Elsa. Upcoming cosplays according to her website are Miss Widow, Dagger, and Metroid's Samus Aran. Dagger, one half of the Cloak & Dagger team, debuted as a vigilante hero in 1982. Her power (ever needed in today's substance abuse epidemic) came after a crime kingpin injected her with a synthetic drug. A mutation transpired giving her laser powers to HEAL substance abuse addictions. Bombshell has not yet stated when she will premiere this cosplay. She appeared as Android 18 (accompanied by Vide) at the Beckley con which benefits women's programs in Beckley. Check out images from the event below.